Guest blogger: Food service director on "Thaw-and-serve"
Our resident food service director Ms. A has joined us again to share her perspective. On the one-month anniversary of her blog, Brave New Lunch, she decided to reveal a little more about herself in cluding her name and state (Ali from Massachusetts). Somewhere in the last few decades, the cooking part of my school’s lunch was whittled away and replaced with thaw-and-serve. It was a gradual change. According to our oldest lunch lady who just celebrated her fortieth year at the school, students once shared meals family-style. At each table, the kitchen crew set out placemats and silverware for each student. Lunch lasted an hour. As the student population grew, there were more mouths to feed every year. The school expanded its property. The kitchen and cafeteria moved to a new space about twenty years ago. Since then the school allocated a few random spaces in the building for kitchen storage, but the kitchen and cafeteria itself hasn’t expanded any further. Today it desperately needs a few more pieces of commercial cooking equipment and space to accommodate those items. 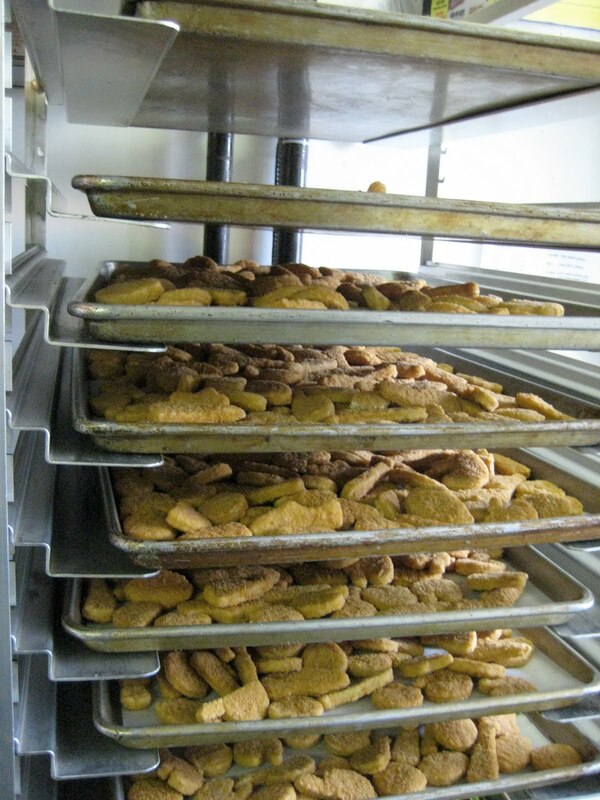 We use two convection ovens to do the bulk of our cooking. Without other pieces, though, it’s very difficult to cook foods that can’t be thrown in the oven. For example, our stovetop steamer we use may be the same kind you use at home. If you can imagine steaming vegetables for 500 in that steamer, then you might get an idea of our difficulties. Thaw-and-serve requires little training and effort. By using precooked foods, the skills and labor normally required for cooking aren’t necessary. The school can hire kitchen help with no little training, which is a lot cheaper than hiring a skilled cook. In the food service industry where labor may cost significantly more than the food ingredients, thaw-and-serve is an attractive option. Thaw-and-serve doesn’t require lots of space or cooking equipment. Schools choose thaw-and-serve so they don’t need to expand the kitchen. Nor is a commercial mixer to knead dough for bread or a steam kettle to boil pasta. As long as there’s enough oven space there’s no need to build a larger kitchen, which could costs tens of thousands of dollars. It’s a huge upfront cost without a tangible or immediate academic payoff. Until the school is ready to put money into the kitchen over other important parts of the school, thaw-and-serve will continue to rule. Perhaps it is a bit harsh to compare today’s school lunch to a feed lot, but the resemblance is there – a feeding operation designed to cram fuel in the mouths of as many as possible in the shortest period of time. In less than 3 hours, all 500 students and staff pass through the school cafeteria in five lunch periods. While fairly calm the first hour, the last hour is chaos. Each lunch begins with a line of people making their way through the main meal line. Each person finds a seat and can get up again for additional helpings of food. Our cafeteria is all-you-can-eat, but to stop huge quantities of food piling up in the waste bin, we only offer one portion of the main meal at a time. The older students come to the later lunch periods and have additional food options beside the main meal. The last lunch gets everything the kitchen has to offer – main meal, soup, salad, deli, and bagel bars. Daily announcements begin five minutes before lunch is over. It ends with plates and utensils being separated from trash. Lastly, a few students spray and wipe each table with sanitizer. This routine happens in each of the five 25 minute lunch periods. There is ten minute in between each lunch so that we can prepare for the next. How the students in the back of the lunch line don’t get indigestion is a wonder. They may not begin eating until a third of the way through lunch. We lunch ladies stuff our food down in less than fifteen minutes. Sometimes I manage to simultaneously have a stomachache and be hungry when I leave school a couple hours later! Eating lunch is simply a means of basic nourishment, nothing else. The quality, nutrition, and time devoted to school lunch in America are at an all time low. Letting our next generation grow up eating like this is appalling. The enjoyment that food can bring and the potential of food as a tool in the academic community are lost too. So happy to read that your elitist, classist and overall snobbish blog was rightfully slammed in my New England city's newspaper this morning. Both you and Jamie Oliver have had such overall unfavorable opinions, it's nice to see that not everyone is buying your "I'm a hero" mindset. Ah, the peanut gallery makes its presence known once more. Ignore the sneers and jeers — arguing with fools only makes you look like a bigger fool! That is a lot of people to feed in a short amount of time! At the school where I worked last year we has around 1,000 kids (K-3). There were over 1,200 the year before but they built a new school and moved the 4-5 there. There were so many kids they had to open an additional serving line and they had tables on the stage area for the kids to sit. Crazy! I think the way schools handle lunch is indicative of the way most of us handle meals. Get it done and over with. Most parents work outside the house now and don't have the time or energy to devote to full on sit down meals with their families. I think if, as parents, we made the effort to make sure two out of the three meals our children ate were healthy and balanced, one meal, at school that was less than perfect, wouldn't be as big of a deal. Most of the kids are eating the same crap at home as they are at school and until parents start accepting responsibility for being just as bad as the schools, things aren't going to change. Most of the people who are outraged by school lunches are the ones who have and take the time to make fresh foods and sit down meals for their children; we're in the minority, most families do not do that. The schools aren't going to change what works for them and countless families because of a few of us protesting the crap in the cafeteria. Sad to say, but it's true. The speediness is one thing, but my middle child has to eat at 10:50 in the morning. School starts at 8:45, so she is essentially eating within 2 hours of arriving at school and then has to make it till 4:15 when she arrives home. Another 5 hours! We are lucky that her particular 3rd grade teacher allows the kids to bring a snack, but most teachers do not. Not only does she eat so early in the day, she only has 25 minutes from the moment she leaves her classroom till the moment she has to leave the cafeteria. I make her lunch so she does not have to make her way through the lunch line (plus she likes homemade lunches better). I remember family style eating. Two kids from each class, a host and hostess, would have the responsibility to set the table for the number of kids who were eating hot lunch. The cold lunch kids sat at the other end of the table. The host and hostess would get serving dishes of food and bring it to the class' table. The dishes were passed around and everyone had to take some of everything. You had to wait until everyone was served. Yes, it took longer, but I don't remember having to scarf my lunch down. It was a calm relaxed atmosphere. MUCH more healthy. Oh and at the end of the week, the host and hostess got an ice cream bar for their service! I was appalled to learn (after trying to understand why my child's coat was so filthy–turns out he drug his arm through someone else's lunch tray) that our school has the kids eat lunch wearing their winter coats. The excuse was that they only have so many minutes to get through the line and eat before recess begins so if they had to wait for kids to put coats on after lunch, it would take too long. The teachers and principal, educated adults all, see no problem with this and think it's totally normal, rational behavior. Sometimes I feel like they treat our children little better than animals. It's very sad. Why even let them sit down? Think of how much time could be saved if they stood in line at the door to the playground with coats on and shoved the food in their faces! We're battling more than just a broken food system. The educational system seems to now focus more on warehousing and crowd control than teaching kids how to behave in the larger world. I can remember being in HS if you had 1st lunch you had a good amount of food and a good amount of choices, 2nd lunch was so-so, 3rd lunch forget it! You were lucky if there were any choices much less any food. The cafeteria and lunch line were nasty and most of the time everything was gone. Mrs. A makes a good point about the logistics and costs involved in preparing home-cooked meals. But I wonder why we, as a country, couldn't find ways to offer more healthy "thaw and serve" options to the schools and the students. Frozen vegetables have nearly the same nutritional content as fresh cooked. If we could just switch from french fries and corn to green beans and broccoli, we could make a huge improvement. Main course do not need to be fried chicken patties and hamburgers made of mostly fillers. Soups, stews, and casseroles also freeze and reheat well, and can be much more nutritious. I feel for the lunch ladies here because they tend to get the anger. Mine is directed at the bureaucrats that make the decisions. I still can't understand why this type of food (that I wouldn't even dream of spending money on or allowing into my home) is considered healthy. Every year our schools send home a letter stating that they don't want you to send any unhealthy snacks with the children to school because they are striving to provide them with healthy eating options. These are not healthy eating options. This is worse than fast food. I packed my daughters lunch today for about $1. Of course, I would have liked to give her a bit more food but she will be lucky to finish her sandwich, blackberries and juice before lunch is over. More than likely she'll come home with half the sandwich at least because she ran out of time. I sure hope that the people that are calling this blog some horrible things take a moment to open their eyes and see that the schools are serving garbage and chemicals to our children and calling it healthy. I do hope that Jamie Oliver and people contributing to the fight and this blog are able to make a difference. I can easily think of several good ways to reduce the costs of workers as well as food so the powers that be should be able to as well. this was an insightful explanation into the economics of school lunch. however, it is disheartening to see that schools have adapted a fast food mentality for school lunch rather than focusing on providing quality food. i remember seeing an episode of 20/20 years ago that focused on an alternative school in wisconsin(read: a place where "bad" kids are sent)and how the school changed from the foods mentioned in this post and throughout this blog to a more natural, fresh diet. not only did it cost roughly the same, but the behavior of the students improved tremendously. maybe if schools would consider the other effects of processed foods, more would get on board with providing higher quality foods. I think one of the big problems with parents not protesting school lunches is simply that they don't realize how much things have changed. As Ms. A explained, everything used to be "family style" at her school. 40 years later, kids are eating TV dinners. I think when most parents look over the school lunch list and see "chili" and "hamburgers" and even a pizza day, they still imagine the lunch ladies of their childhood, stirring a big pot of soup, slicing veggies for the burgers, and kneading dough for the pizza. What Mrs Q and Jamie Oliver are doing isn't so much… oh what did that fool just call it… "classicism" as it is an effort to show parents that times have changed. I think it's at least better that parents are becoming AWARE that times have changed, even if it's another ten years before they do something about it. If the most they do is ask their kids not to choose the neon milk, it's at least a step in the right direction. Impressive! My high school had about 2,000 students, if I remember correctly, and only one lunch period. I'd say most people brought their lunch from home, though, otherwise I don't know how the staff would have survived. I'm really surprised to see all of the 'elitism' accusations being thrown around recently. It is not elitist to eat fruit or vegetables or be a proponent of injecting these things into our children's diets. That, in my opinion, is the point of blogs like these – that no one should be denied these basic food groups. Because one person can and another person cannot afford them does not make the first elitist, it makes them fortunate. To accuse them of being elitist because they want to help the second person also be able to access healthy food is preplexing and mind boggling. I thought we were all in this together? How can a blog that tries to address the need for healthy nutrition for our children be "elitist, classist and overall snobbish" ? I don't understand… this isn't about pointing fingers, but about how to teach our children better. My husband and I are state employees, I'm simply stating this to give you an idea of our income. I can assure you there is nothing snobbish or elitist about out life, but the quality of life of my children comes first, above all. Life of quality, for me, includes healthy nutirion, taking the time to sit down for a family meal etc. Witowski family I completely agree, parents need to start taking responsibility; it's not the schools teaching our children that bad foods are acceptable, the kids are learning it at home. The school I work at has a lot of similarities to yours. We serve around 475 to close to 500 daily and the equipment and time situations (both for prep in the kitchen as well as for student time to eat) sound very similar. I think the center of the plate items are one of the biggest challenges for me. We do offer fresh fruit daily (cut for ease of eating – such as halved apples, wedged oranges) along with canned fruit choices. We don’t have a salad bar (time & space), but offer a tossed salad as one of the vegetables at least 3 times per week. Most days have a hot vegetable as well (brunch menu days don’t), and we offer more than the mandated amount of fruits and vegetables. Still, reading this blog, that doesn’t seem like it’s enough, since it’s not local, it’s not all fresh, not grown by students and so on. It can be quite discouraging. @Anonymous – LOL. I can't help but laugh at you! Thanks for the insight, Ms. A! It is so valuable in the discussion that goes on here to understand the WHYs and HOWs of the current state of school food. Nici: I totally agree with you. Thaw and serve can and should be done with healthier products. I believe the government needs to mandate it for the National School Lunch Program. INDIANAPOLIS — The nation's schools, under fire for unhealthy school lunches, well-stocked vending machines and phys ed cuts, may actually do a better job than parents in keeping children fit and trim. A study found that 5- and 6-year-olds gained more weight over the summer than during the school year, casting doubt on the assumption that kids are more active during summer vacation. One of the central points this blog makes is that school lunch may be the only meal low-income kids get during the day, and as such, it should be as nutritious as it can be. Someone please explain what's elitist about that, 'cause I don't get it. I was just trying to share some pictures of what our school makes. I posted a blog and put some pictures up. I think…..
Keep up the good work, Mrs. Q and guest bloggers, as ordinary people who care enough to speak up. wow, I'm so disappointed to read this. Lunchtime should be seen as another time for kids (in any grade) to learn. They should be learning healthy eating habits – both what foods to eat to be strong and healthy, and how to properly eat those foods (slowly, so their bodies can adequately digest it)! I can't believe they are in and out in 25 minutes. That's really sad. Our entire public school system is in a bad place and needs to be completely redesigned in order to produce strong, healthy, intelligent adults. @Maggie, Don't get discouraged because you aren't doing the all-organic, all-local, all-fresh, kid-grown thing. That isn't going to be feasible for everyone. Even if it is feasible for your district, you can't change the system overnight unless everyone's on board. Do what you can when you can, and push for small changes. It seems like your priorities are in the right place. Not everyone can do the pie-in-the-sky, Cadillac approach. It gives you something to shoot for, but don't kick yourself for not doing it. This post has shed a lot of light on the challenges facing school districts and how some systems came to be. The picture of the CN (chicken nuggets) is grossing me out really badly.